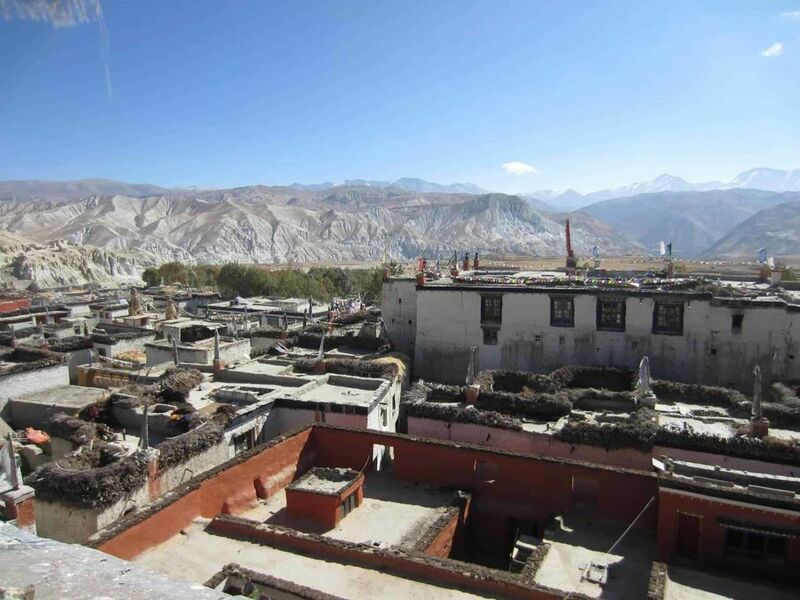 This Mysterious Upper Mustang trek brings you into the hidden world of the old Buddhist kingdom of Mustang, also called Lo. The regions isolation from the outside world has contributed to a highly preserved Tibetan culture and unspoiled nature. The features of the isolated and imposing landscape are equally assisted by the cultural beauties as monasteries, chhortens, mani walls and the whitewashed houses throughout the trail. The frequent up and down trail, the red sandy cliffs, view of Dhaulagiri and Nilgiri Mountain ranges are very heartwarming. Desert topography behind massif Dhaulagiri and Annapurna ranges. Experience the highly preserved culture and tradition of Tibetan people. 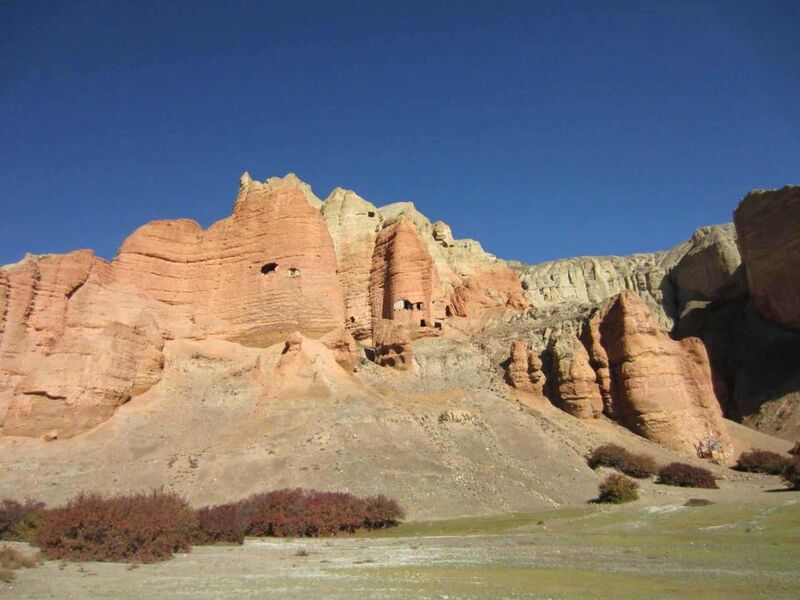 Frequent up and down trail monasteries, stupas, mani malls, whitewashed houses and the red sandy cliffs. Sparkling capital kingdom -Lo Manthang. Today would be the most exhilarating day where your leader introduces you to our city tour expert who guides you to the most pious Hindu and Buddhist religious place that are listed in the world heritage sites and elucidates you the entire mysticism over its existence. The rest of your time in Kathmandu is free for further exploration and some last-minute shopping in Thamel area near your hotel. Your guide will come to your Hotel early in the morning at 6:30 am to pick you up and then the bus leaves around 7.30 am to Pokhara. The bus ride will reach you to Pokhara after 7 continuous hours. Early morning you will be flying northwest from Pokhara towards the great portal between the snow-capped peaks of Annapurna and Dhaulagiri. You will enjoy the well-raised massifs of more than 8,000 m and the deepest gorge on this planet. 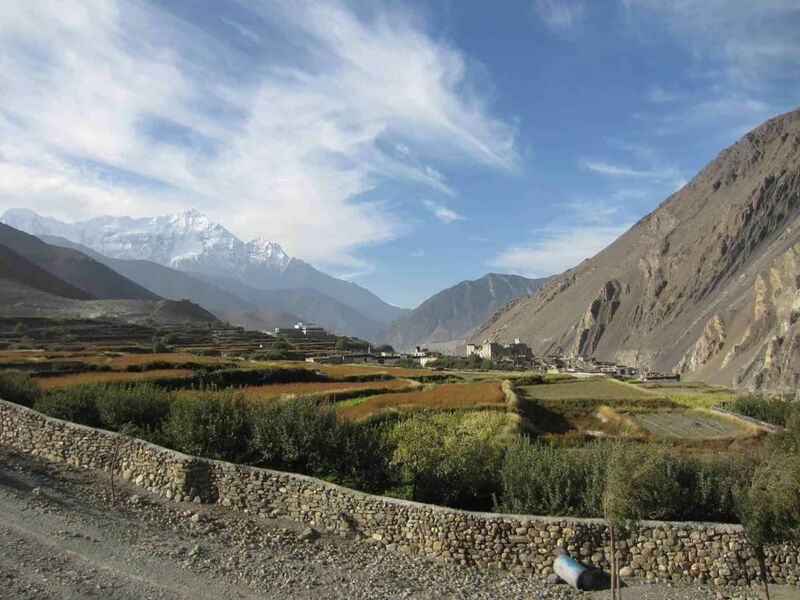 On arrival to Jomsom, you will meet rest of the trekking staff. From Kathmandu, you will have a guide with you. 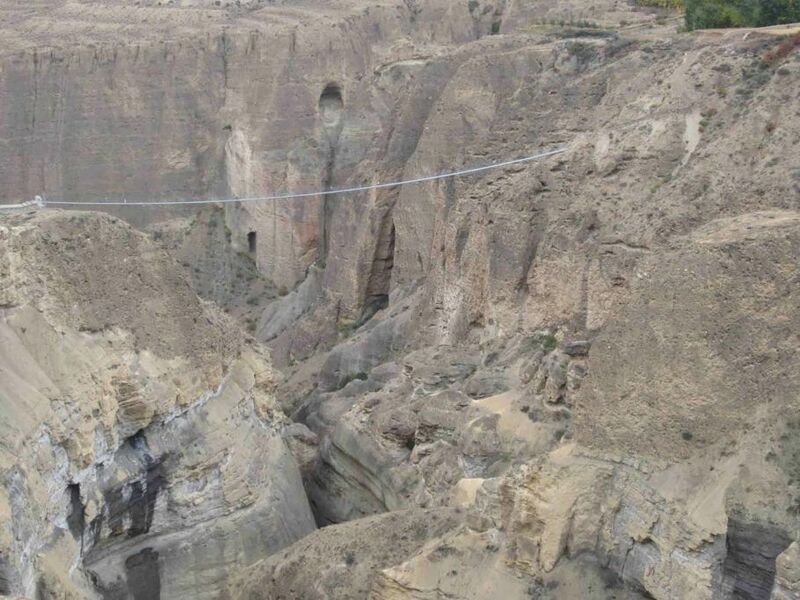 You start to trek towards Kagbeni, the main gate to Upper Mustang and the trek will take you around 4 and half hours to reach Kagbeni. The trail leads up towards the east bank of the Kali Gandaki climbing over many ridges as it heads north and reaches Tangbe village. The town is a labyrinth of narrow alleys amongst white washed houses, fields of buckwheat, barley, wheat and apple orchards. The Nilgiri peak dominates the southern skyline of Kagbeni, all the way with different shapes. Beyond Tangbe we reach Chusang village in about 1/2 hour, then we trek and cross the river which continues north climbing up to a huge red chunk of the conglomerate that has fallen from the cliff above, forming a tunnel that the Kaligandaki follows. 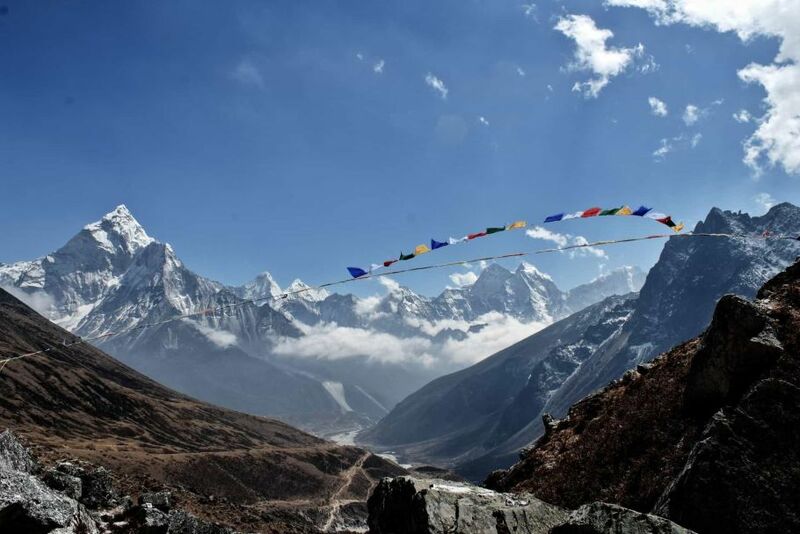 The trek now leaves the Kali Gandaki valley and climbs steeply up a rocky gully to Chaile. The trek will take you 6 hours in total to reach here. From here the culture changes from the Manangi culture to the Tibetan culture of Lo. The climb continues along steep, treeless, water less terrain, along the side of the spectacular steep canyon to a pass and cairn of rock. Then the trail makes a long gradual descent to some Chortens on a ridge and with further descent comes a pleasant trail to Samar village. We climb above Samar to a ridge, and then descend into a large gorge, where the trail goes into another valley field, crosses a stream and climbs up to a ridge at 3,800 m. The route climbs over yet another pass, follows a ridge and then descends to Shyangmochen. From there we gently climb to a pass at 3770 m and descend to Geling Village. It will take around 7 hours to reach this village. From Geling village the trail climbs gently up to an interesting pass Nyi La and descends below the blue, grey and red cliffs. After crossing a steel bridge of the Tangmar Chu (river) you will arrive to Mani Wall, perhaps the longest and most spectacular Mani wall in Nepal. Climbing over another pass at 3600 m, the route makes a long gentle descent to Charang village. The huge five-story white Dzong and red Gompa are the main attractions to visit, and observe collection of statues as well as many large paintings of seated Buddha. After 7 hours of walking, you finally reach Charang. This is an opportunity to visit two other villages on your trek. The trail climbs steadily until Lo-Gekar. Lo-Gekar Gompa is older than Samye Gompa in Tibet and is one of the oldest Gompa of Nepal. Few meters ahead lies the 1200 years old Ghar Gompa with Guru Rinpoche as the primary figure. The Gompa is also famous for its rock paintings. To reach here it takes approximately 3 hours from Charang. 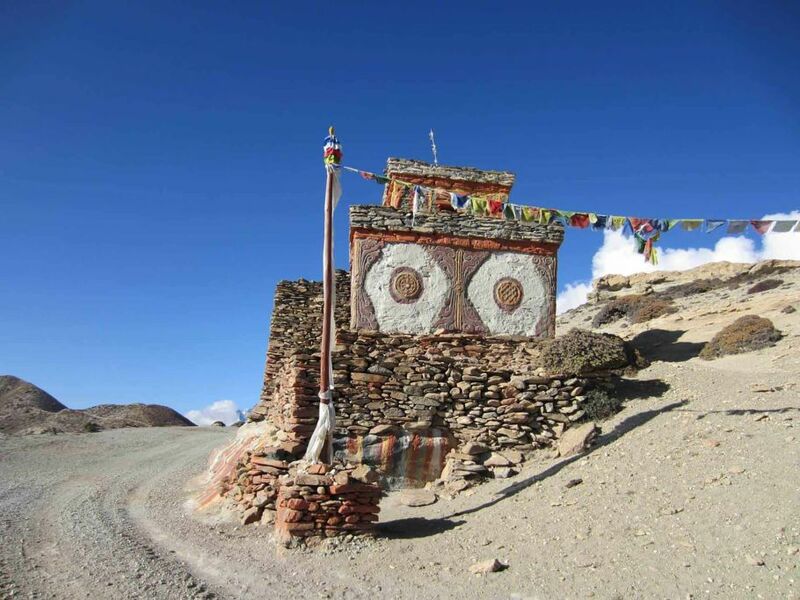 According to the legend, anyone who makes one wish at the Ghar Gompa, their wish is fulfilled. After visiting Ghar gompa and spending an hour to roam around, the trek continues to Lo Manthang. The trail until Lo-Manthang is fine with some minor climbing. Finally from the ridge, there is a view of the walled city of Lo. After a short descent, cross the stream then climb up into the plateau of Lo-Manthang. 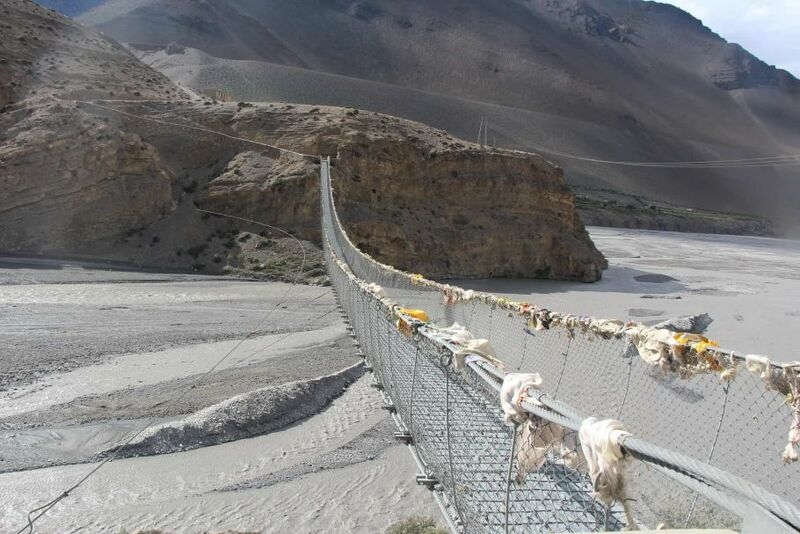 The total duration to reach Lo Manthang would be around 4 hours from Ghar Gumba. It takes around 2 hours to reach Namgyal Gompa. Namgyal Gompa situated on a hilltop serves as an important monastery for the local community, also serving as a local court. 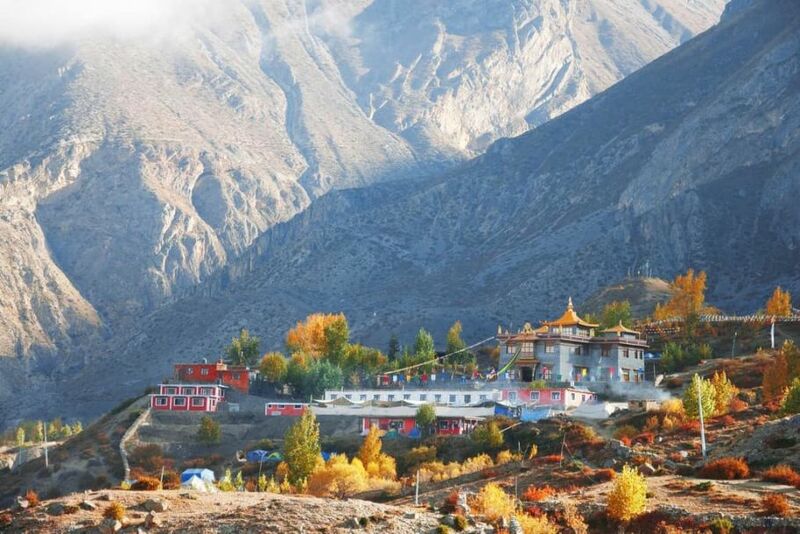 After visiting Namgyal Gompa continue the tour to Tingkhar, which is a village of around 40 houses, the last main village to the northwest of Lomanthang. After visiting Namgyal Gompa and Tingkhar return to Lo Manthang. From Lo-Manthang the trail walks straight till Dhi pass 4100 m and descends down to Dhi village within 5 hours of the trek. The trek from Lo Manthang to Muktinath is harder, but more rewarding and interesting than the west side of the valley. Dhi village is one of the best villages of whole Lo-Manthang and it seems more prosperous and settled in a very suitable place. We then cross a river to follow a path along the left bank of a river side to Yara village at (3650m). From Yara, the trail goes through the river for around 2 hours and crosses a river from Damodar Kunda, one of the sacred lakes. There is no bridge on the river so you need to walk across in bare feet to cross this river. After crossing the river the trail climbs high above a pass of 3850 m. The trail goes through a grassless, treeless bare hill. After the pass, the trail again drops directly to Tangbe village at an elevation of 3370 m. Tangbe is a small village of around 30 houses but most of the houses are attached to each other. On the rooftops, one can see piles of dry woods, which also reflects the prosperity in their society. The duration of the trek for this day would be around 7 hours. The trail walks through a steep ridge of hills providing some fine views of the wind carved hills. 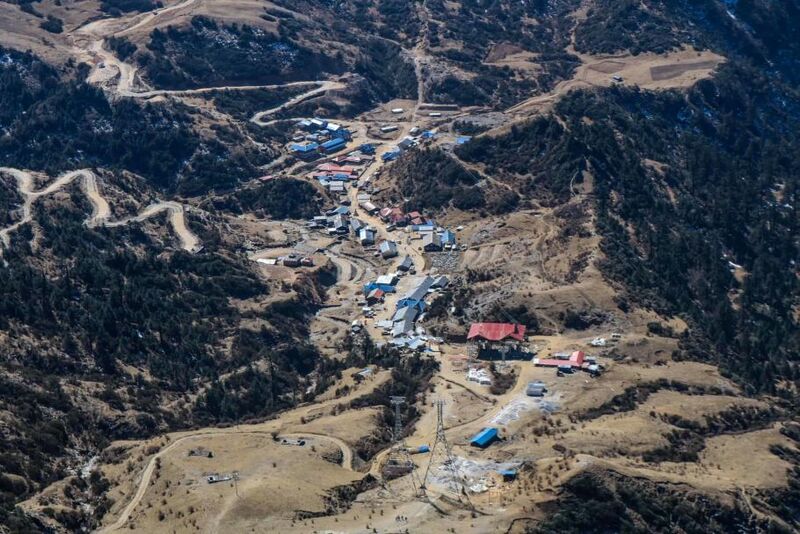 Tetang village is formed between 2 hills; they must have found it a safe place to avoid the strong wind that hits the entire Kali Gandaki valley. 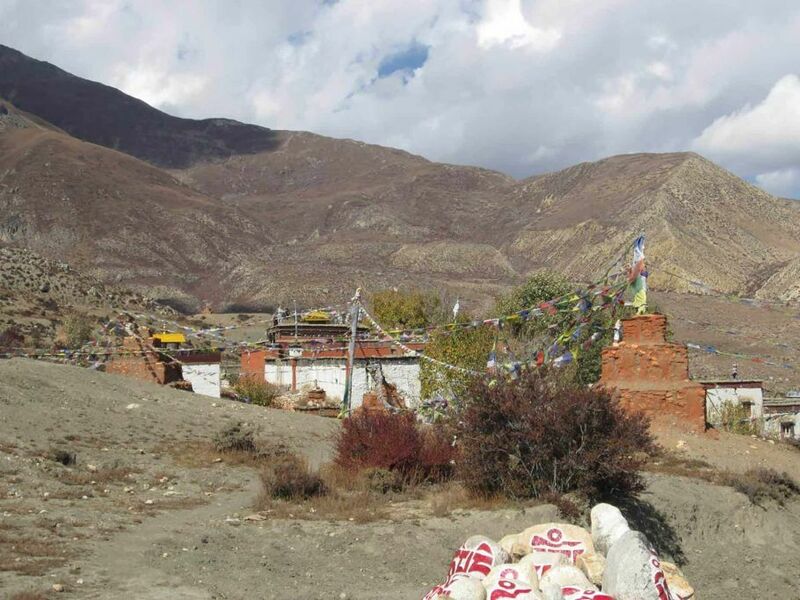 Tetang is the upper village of Chusang, which we visit on the first day entering to Mustang from Kagbeni. It will take around 9 hours to reach Chusang. This is the last day of the trek. We follow our trail through the village after passing the scenic Mani walls. 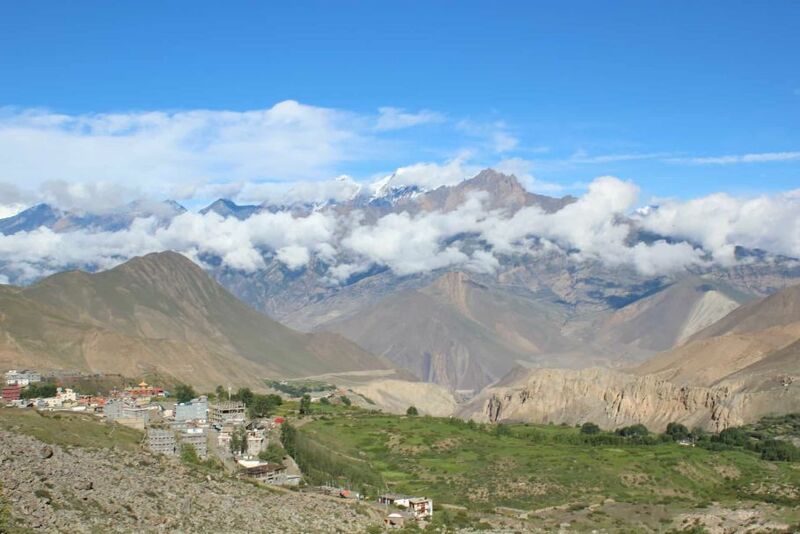 We walk past the plateau, and ascend until we reach a small pass from where we can see high mountains and picturesque view of the holy Muktinath temple. We follow the trail taking us to Muktinath temple passing the Kani/gate. We explore the temple, and rest for sometime. From Muktinath we take a local jeep and drive back to Jomsom. The drive will be of around an hour. Today 30 minute morning flight takes us from Jomsom back to Pokhara. Once we arrive at Pokhara airport, we then drive to a hotel. In the afternoon we will have sightseeing tour around Pokhara valley, which covers Fewa Lake, Davis waterfall, Museum, Tibetan refugee settlement and Gupteshower cave. In case you are flying back to Kathmandu on the same day, you will rather be taken to lakeside and not in hotel. Depending upon the layover time in Pokhara, you can book for a sightseeing trip. This trip would come for an additional price and can be discussed at the time of booking. In case you are travelling to Kathmandu by bus, you will stay overnight in Pokhara. It’s also a spare day in case of bad weather in Jomsom. Overnight back at the hotel in Kathmandu. If you are interested in continuing onto Chitwan Jungle Safari, River Rafting Adventure, Kathmandu Shopping Tour or Scenic Everest Flight, you may opt for them. In the evening we will have a farewell dinner in a traditional Nepalese restaurant with cultural performances. heavy items are carried by porters or mules and personal belongings that you may need for the day like money, water bottle, rain gear, camera, sun cream and toilet paper etc. should be carried by yourself. So you are briefed to pack items in two different bags. Glacier glasses-100% UV protection with side shields and a hard-sided storage case (i.e. Julbo or Cebe). This is to protect your eyes from the h3er rays of the sun due to the thinner atmosphere which can cause a painful condition known as snow blindness. Regular sunglasses are not sufficient. If you wear prescription glasses, speak to your doctor about prescription glacier glasses, perhaps with transitional lenses. Some people like earmuffs; These are optional; a good hat, balaclava, and hooded jacket should really be sufficient, but this is a personal choice for some people (optional). Instant hand warmers are always nice in a pinch, but really shouldn’t be necessary on the trek. Bringing appropriate hand protection as recommended above, should be sufficient (optional). 1 pair light to medium weight water proof hiking/trekking boots. Ensure a good fit with layered socks and you have worn them before to get used to it (otherwise you will get lots of blister).